UNITED NATIONS (Reuters) - Iran and the United States held their highest-level substantive talks in a generation on Thursday, saying the tone was positive but sounding cautious about resolving the long-running standoff over Iran's nuclear program. U.S. Secretary of State John Kerry and Iranian Foreign Minister Mohammad Javad Zarif met after Zarif held wider talks with the United States and other major powers to address Western suspicions that Iran may be trying to develop atomic weapons. Diplomats from the major countries described the atmosphere of the wider talks in positive terms, but they, as well as the U.S. and Iranian foreign ministers, stressed the difficulty of resolving a dispute that has eluded solution for a decade. "We had a very constructive meeting," Kerry told reporters after the talks at the United Nations, where he and Zarif had sat next to one another and shook hands, according to a senior U.S. official, in a gesture that suggested a desire by both sides to explore how to ease their more than three-decade estrangement. But Kerry added, "Needless to say, one meeting and a change in tone, which was welcome, doesn't answer those questions yet and there is a lot of work to be done." The United States wants Iran to address questions about its nuclear program, which Washington and its allies suspect is a cover for developing nuclear weapons. Iran denies that, saying its program is for peaceful, civilian uses. Zarif, a U.S.-educated diplomat, also sounded a cautionary note and insisted on quick relief from the painful U.S., European Union and U.N. sanctions imposed for Iran's refusal to suspend its uranium enrichment program. "I am satisfied with this first step. Now we have to see whether we can match our positive words with serious deeds so we can move forward," he told reporters. "Of course as we move forward, there has to be removal of sanctions and in the end game there has to be a total lifting of all sanctions and both bilateral sanctions, unilateral sanctions as well as multilateral sanctions and U.N. sanctions and we hope to be able to move in that direction within a short span of time." Kerry said Zarif had put some "possibilities" on the table, but stressed there was more work to be done. A senior U.S. official said after the meeting that Iran had proposed fully implementing an agreement on its nuclear program within a year. 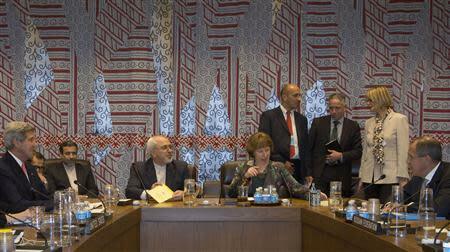 The official added that while Zarif had offered suggestions, "there is a lot more to understand." In an interview before Thursday's meeting, Kerry said the United States would not lift sanctions until Iran showed it was not pursuing a nuclear weapons capability. He told the CBS show "60 Minutes" that one concrete step Iran could take to show it was serious about not seeking nuclear arms would be to open up its Fordow uranium enrichment facility to U.N. inspectors. "The United States is not going to lift the sanctions until it is clear that a very verifiable, accountable, transparent process is in place, whereby we know exactly what Iran is going be doing with its (nuclear) program," he said. Iran's new centrist president, Hassan Rouhani, has said he would like to see a deal with world powers in three to six months. Kerry told CBS it would be "possible to have a deal sooner than that depending on how forthcoming and clear Iran is prepared to be." The meeting was a very uncommon encounter between top officials of the United States and Iran, which have been estranged since the 1979 overthrow of the shah and the taking of American hostages at the U.S. Embassy in Tehran. A State Department official said it was the highest-level "official" meeting between U.S. and Iranian officials since before the Iranian Islamic Revolution, although there had been "informal" interactions at the same level in the past 10 to 12 years. Kerry and counterparts from the five permanent members of the U.N. Security Council and Germany described their meeting with Zarif on the sidelines of the U.N. General Assembly as "a change in tone" from encounters with Iran's previous, hard line government. European Union foreign policy chief Catherine Ashton, who chaired the meeting, told reporters it had been "a substantial meeting. Good atmosphere. Energetic." She said the two sides had agreed on an "ambitious timetable" to address Western concerns and would meet again in Geneva on October 15 and 16 "to pursue the agenda to carry on from today's meeting and to hopefully move this process forward." Ashton also added a note of caution, saying it was important to focus on "effective work that we do on the ground." The New York talks involved the five permanent members of the U.N. Security Council - Britain, France, Russia, China, the United States - and Germany, known as the P5+1. Iran's new president is a moderate cleric who has stepped up efforts to improve Iran's image abroad during his visit to New York this week and has said Iran will never develop nuclear weapons. U.S. President Barack Obama on Tuesday cautiously embraced Rouhani's gestures as the basis for a possible nuclear deal and challenged him to demonstrate his sincerity. But the failure to orchestrate a handshake between the two leaders, apparently because of Rouhani's concerns about a backlash from hardliners at home and perhaps Obama's concerns about the possibility of a failed overture, underscored how hard it will be to make diplomatic progress. Even without making any real concessions so far, Rouhani has offered a softer, more reasonable tone than his stridently anti-U.S. predecessor, Mahmoud Ahmadinejad. The sanctions imposed on Iran have begun to bite severely. Iranian oil exports have fallen by about 60 percent in the past two years as the EU stopped purchases and most Asian buyers drastically cut imports because of the sanctions. Iran is now earning only around $100 million from oil sales a day as opposed to $250 million two years ago. The six powers said in February they wanted Iran to stop enrichment of uranium to 20 percent, ship out some stockpiles and shutter a facility where such enrichment work is done. In return, they offered relief on international sanctions on Iran's petrochemicals and trade in gold and other precious metals. U.S. officials say that offer remains on the table. But signaling some of the obstacles that could hamper any new diplomacy, Iran on Thursday sharply criticized the U.N. nuclear watchdog over "baseless allegations" about its atomic activity. It was an apparent reference to the International Atomic Energy Agency's concerns, spelled out in a series of quarterly reports, about what it calls the possible military dimensions to Iranian nuclear activities. The Fordow uranium enrichment facility Kerry referred to is a secret plant buried 299 feet underground, making it difficult to bomb should the West or Israel decide they need to take military action against Iran's nuclear program.